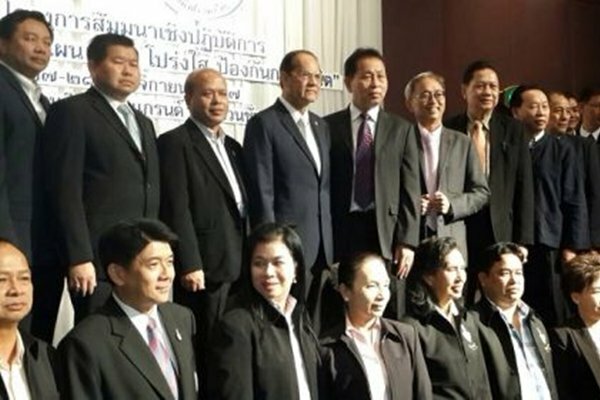 A team of PPAO officials led by its President Paiboon Upattising took part in a two-day seminar on transparency and anti-corruption management for Provincial Administration Offices. 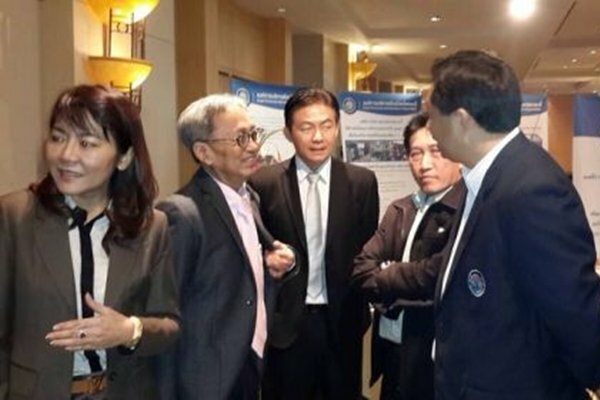 The seminar, organized by the Office of the National Anti-Corruption Commission, was held at the Miracle Grand Convention Hotel, Bangkok, on November 27 – 28 2014. The PPAO officials who attended the seminar were: Council Chairman – Theera Jiasakul, Chief Administrator – Watcharin Pathomwattanapong, Chief of Internal Audit Division – Youngyut Laksanawibunkul. Corruption is a national challenge and one that all sectors are making a concerted effort to prevent and eliminate from all levels in order to create an ethical society whose authorities are honest, transparent and subject to investigations. The aims of the seminar were to promote a sense of integrity among Provincial Administration executives and officials and support them in anti-corruption management. The seminar was intended for all of Thailand Provincial Administrative executives including presidents, council chairmen, chief administrators, and directors of Supply and Property units. Altogether, 304 executives took part in the seminar. Recently, PPAO received an anti-corruption award of the year 2014 from NACC. It has also signed an MoU with the NACC on the occasion of NACC 15th anniversary on November 17, 2014. 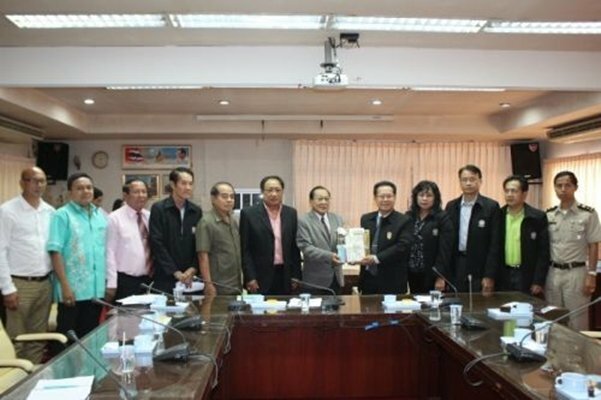 Only two provincial administration offices received this award – Phuket and Chacherngsao. On a subdistrict level, 15 SAO received the same award. On Thursday 16th October 2014 at the OrBorJor Phuket Office, the Phuket National Reform Council Representative – Khun Cherdchai Wongseree meet with OrBorJor Phuket President – Khun Paiboon Upatising following his nomination by the selection panel, including Khin paiboon, to represent Phuket on Thailand’s National Reform Council. 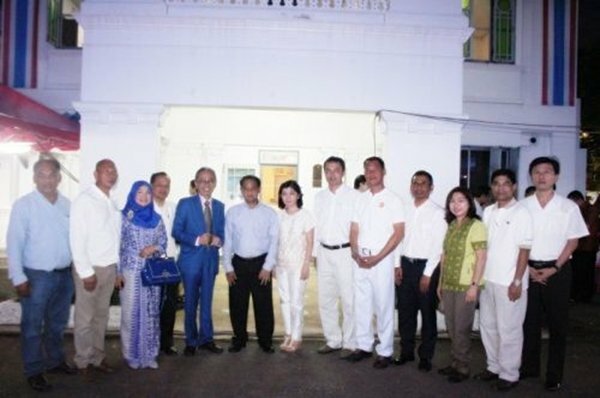 On Wednesday October 1st 2014, a team of local government officials welcomed the new Governor of Phuket Nisit Chansomwong and his wife and President of the Phuket Red Cross Natsaree Chansomwong at their residence in Phuket Town. 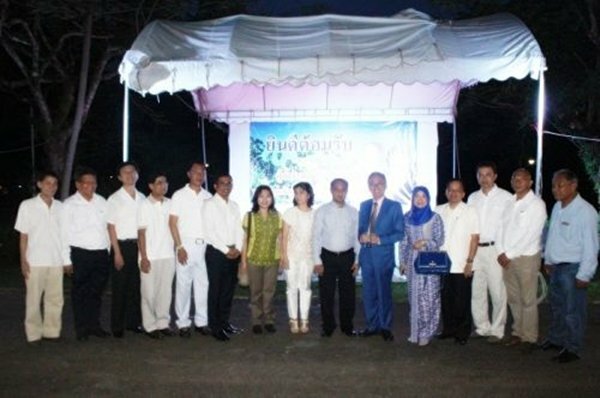 PPAO Chief Executive – Paiboon Upattising, together with PPAO executives, council members, division heads and staff, was part of the welcoming party. Also present to greet the new Governor were Phuket community leaders and members of the public as well as officials from Ratchburi where Mr Nisit held position prior to moving here. 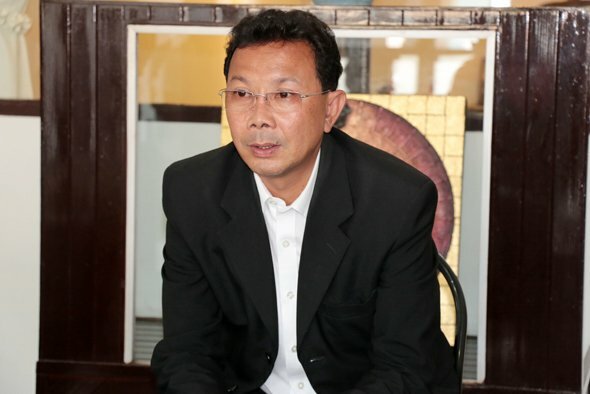 Earlier today, 21st September 12014, it was announced that the current Governor of Phuket Maitree Intrusud was being promoted to a higher position with the Interior Ministry. It has been reported that he will take up the position of Deputy Permanent Secretary within the ministry. 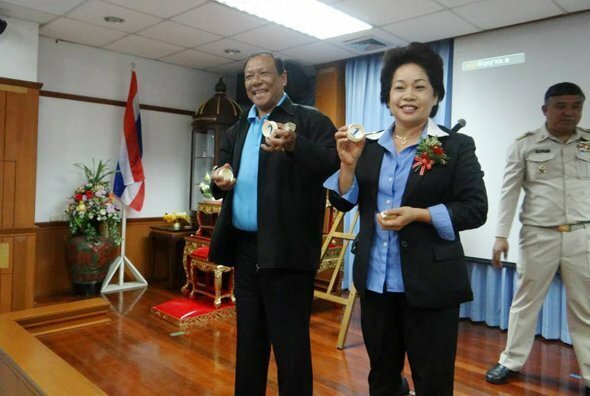 In view of this move, it was announced this afternoon that Nisit Jansomwong would be replacing Khun Maitree as Phuket Governor within the next two weeks. 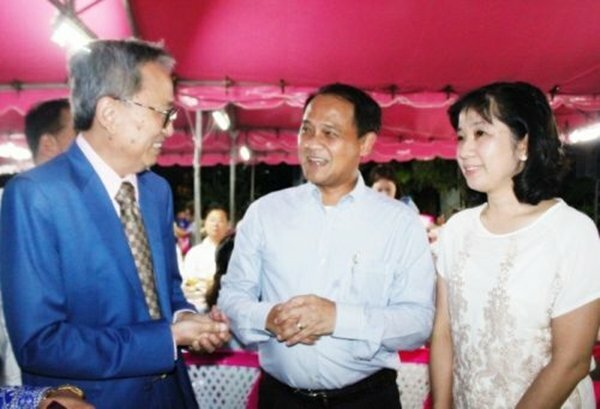 Khun Nisit was previously governor of Ratchaburi province. 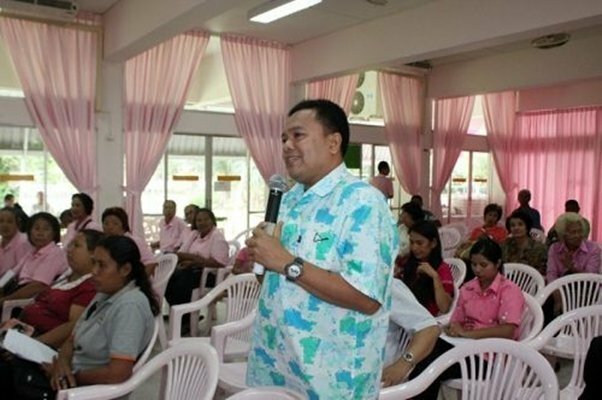 16 Oct 2009 – Deputy Governor of Samut Prakan. 2 Apr 2012 – Management consultant and provincial integrated Sp.mt. (cord.). 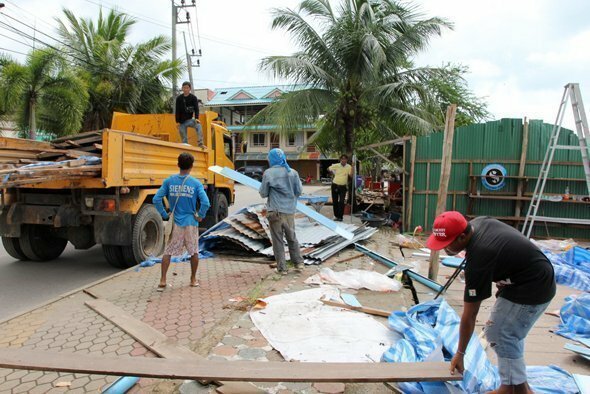 On Wednesday 16th July 2014 at Moo 6, Ao Por, Tambol Paklok, Amphur Thalang, Phuket, Mayor of Tambol Paklok – Khun Panya Sampaorat, and a team of around 100 made up of army, police and Paklok Municipality Officers gathered to assist villagers in demolishing illegal businesses which had been built and encroach the public beach. 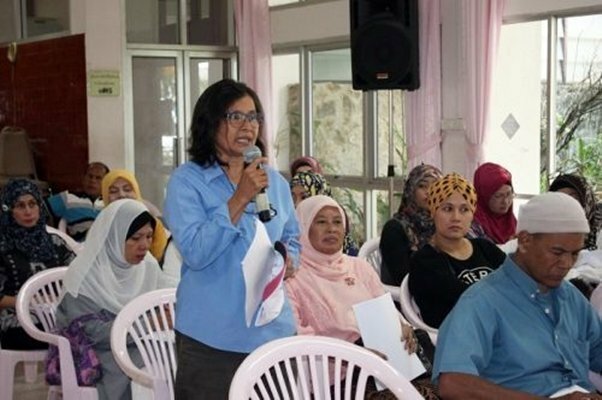 The action took place after the National Council for Peace and Order (NCPO) ordered that all Phuket beaches should be handed back to the public. Khun Panya said “We were informed that there were a number of illegal businesses set up in the areas of Moo 6 in Ao Por, Yamu Beach and Moo 7 in Ban Para, all of which are public beaches and which no one has the right to run a business from. Moo 6 in Ao Por has been encroached more than the other areas, and 1 week ago officers had spoken to the business owners to advise them that we would be here today to demolish the said businesses. We have demolished over 30 buildings which have encroached on the beach and we still have some more to do. However, I am grateful that the locals have cooperated with us fully and understand why we are doing this. 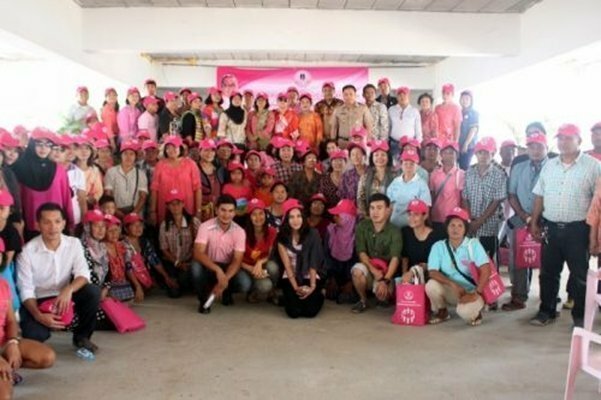 Phuket held a reconciliation forum at the PPAO Office in Phuket Town on Monday July 14th 2014. PPAO Chief Executive Paiboon Upattising, accompanied by Deputy Chief Executive – Chaowalit Na Nakorn, Chief Advisor – Samasak Rattanasaenyanuparp, Chief Administrator – Watcharin Pathomwattanapong, Council Chairman – Pradit Saengchan, Deputy Council Chairman – Sakchai Chaowai, Council Secretary – Kraiwut Khumban, Council members, and Division heads opened the forum which was attended by 150 participants from relevant organizations and groups. Mr Chayot Wisartpong acted as forum moderator. 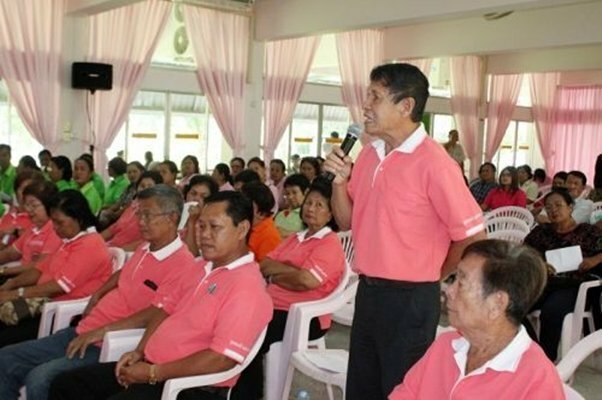 Following the instructions of the Phuket provincial authorities, PPAO has established a PPAO Reconciliation Center Towards National Reform which acts as a depository for viewpoints and suggestions that have emerged from sessions organized by local administrative offices, with political, governmental, community, business-based, and NGO groups throughout the province. Leading the discussion, Mr Paiboon said he believes all levels must work together to support the NCPO’s agenda on national reconciliation in time for elections, which according to NCPO will take place in September next year. To mobilize the nation forward, Mr Paiboon said, Thais must unite and reconcile their differences. The forum is a space where opinions and suggestions in relations to national reform are collated and presented to NCPO for further actions. Topics covered by the discussion groups included: political, judicial, administration, education, economic, societal and political disparity, socio-economic, and environment reforms. Reforms on morality and corruption of politicians and government executives were also mentioned. 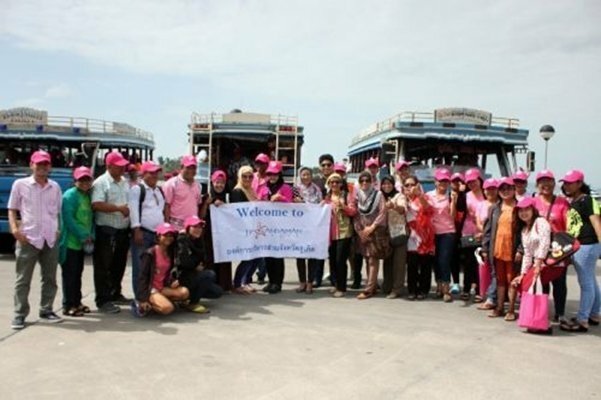 To follow the National Council for Peace and Order’s reconciliation program, and to promote local people’s participation in it, PPAO recently organized a nature and environment conservation study trip to Pa Khlok area of the island. 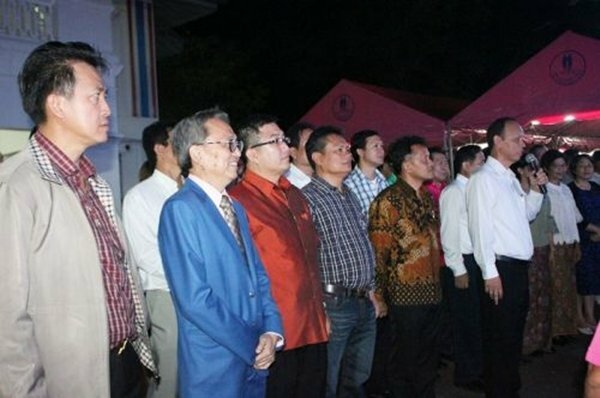 The trip was preceded by an opening ceremony chaired by PPAO Council Chairperson – Pradit Saengchan and attended by Pa Khlok Mayor – Panya Sampaorat, a team of PPAO officials and Council Members (Theera Jiasakul, Winit Hongatikul, Sakchai Chaowai, Kraiwut Kmban, Kamron Pantip), community leaders, who all gathered at Durul Yanna Ban Bangrong Mosque in Tambon Pa Khlok. Altogether 180 people participated in the program. In his speech, Mr Theera highlighted the objectives of the program, which are to campaign for participation of the community in environment conservation and to raise awareness of back-to-nature lifestyle and self-sufficiency. As organizer, PPAO also hopes that the program will create conciliation among members of the community with different political bias. The program was divided into two sections, with lectures in the morning and a field trip in the afternoon. Morning lectures included topics such as: building a strong community and people’s participation (by Deputy Director of Phuket Internal Security … Krisada Ratanasupa) and community administration (by Seb Kerdsap, Chair of Ban Bangrong Agricultural Eco Tourism Office). 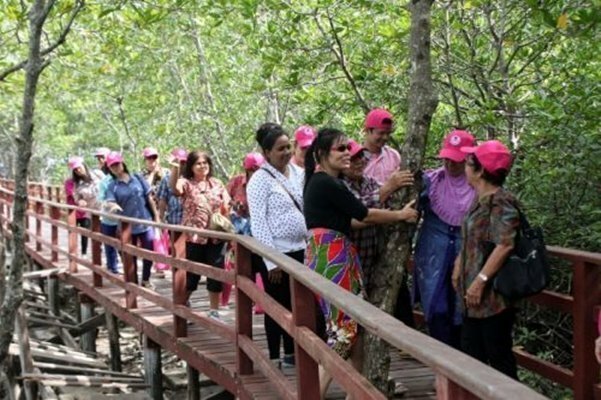 The afternoon activities involved a field trip by boat through Ban Bangrong mangrove areas, together with lectures on environment conservation (by Seb Kerdsap) and people’s participation in community network (by Samran Kongnam, Chair of Al-al Mana Cooperatives). Mr Pradit highlighted the benefits of the project which he said contribute towards building a strong community and preserving natural resources. Conservation also means building viable income from careers relating to eco tourism, for example. He urged all participants to spread the information learned within their own communities. He also thanked all concerned for the help with this project. 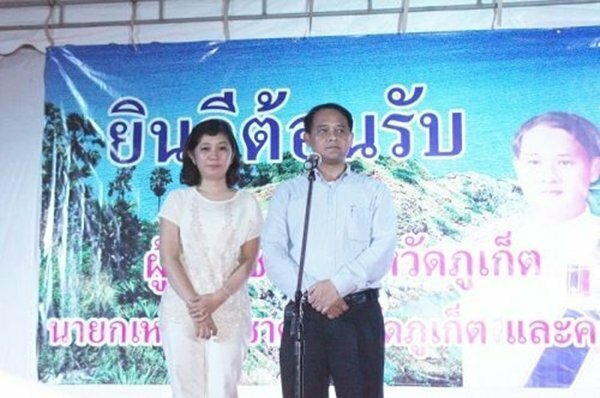 Mr Panya, Mayor of Pa Khlok, reiterated the benefits of the project, as above. 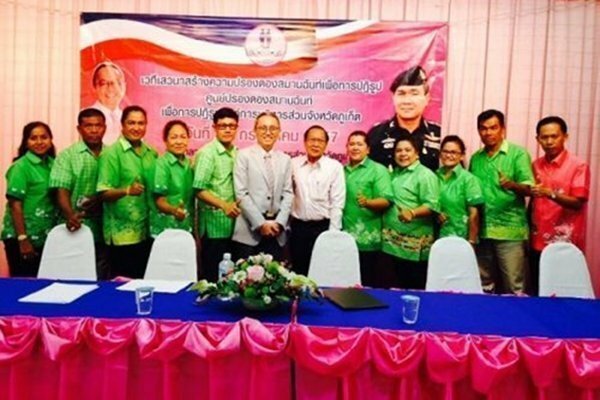 On June 11 2014, PPAO officials led by Deputy Chief Executive – Chaowalit Na Nakorn, acting on behalf of Chief Executive – Paiboon Upattising, along with PPAO executives, Council members, officials and staff welcomed a panel of officials from the Ministry of Justice. The officials were led by Tawatchai Thaikyo – Deputy Permanent Secretary for Justice, and members of the Head of Administration Developing Unit and Inspector-General of Office of the Permanent Secretary, and other officials, the panel led a discussion on the possibility of setting up a local community justice center to serve the public in need of such services. On 27th May 2014 at Sanam Chai Park in Phuket Town, Maj Gen Peerapon Wiriyakul – Commander of the Royal Thai Army’s 41st Infantry Division received a letters of gratitude, flowers and encouragement from various organizations in Phuket including the Formal Education Network, representatives from the Network of Farmers, women from the Volunteers Guards, military students, school and university students, government officials. 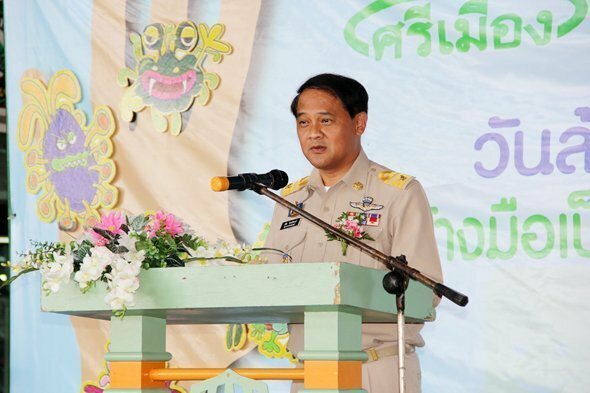 There were around 700 people who turned out at the park and Maj Gen Peerapon promised that he would pass on the thanks to General Prayuth Chan-Ocha and that they help resolve the country’s problems as quickly as possible. 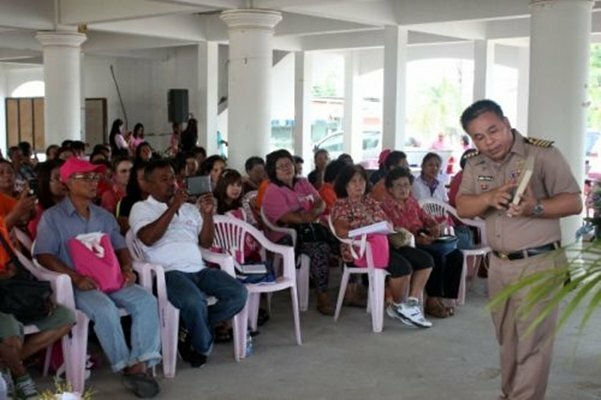 Phuket has now been sent military personnel to help maintain peace in the community areas and to assist police with security at Tha Chat Chai Checkpoint in Thalang. However, the military will be unarmed to ensure they do not cause panic or concern amongst the public and the island’s tourists. 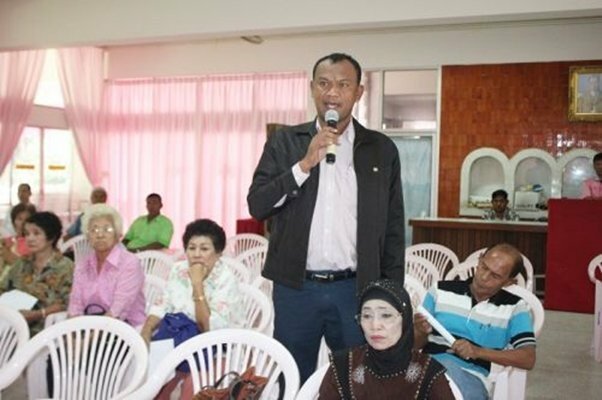 From 08.00 to 15.00 on 26th April 2014, at the Phuket Election Commission Office, those on the electoral role in Patong City had the chance to vote for their chosen candidates for Patong Municipal Council Members and also the much talked about Patong City Mayor position. The election saw 8,679 out of 12,651 registered voters turn out for the election, or 68.60% of voters. Khun Chalermluck Kebsub (former Phuket MP) received 4,390 votes beating long term and controversial former Mayor Pian Keesin who received 3,330 votes. 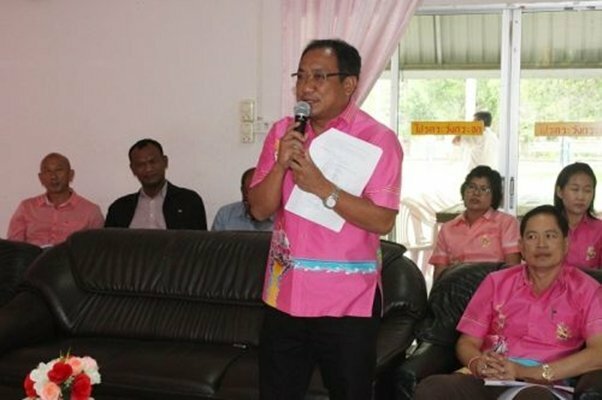 It is believed Khun Chalermluck Kebsub will be the face to reinvent the political face of Patong after seeing Khun Pian Keesin serving as Mayor for the last 20 years. 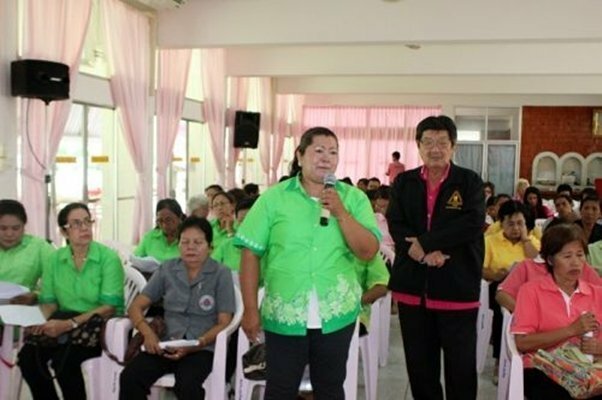 Since late November 2013, the Phuket branch of the People’s Democratic Reform Committee (PDRC) had been rallying in front of Phuket Provincial Hall to demonstrate against the Thai government, and urging the government agencies, working at Phuket Provincial Hall, to stop working. Their actions saw the closure of the entrance to the hall, and the prevention of civil servants going to work inside for over 4 months. 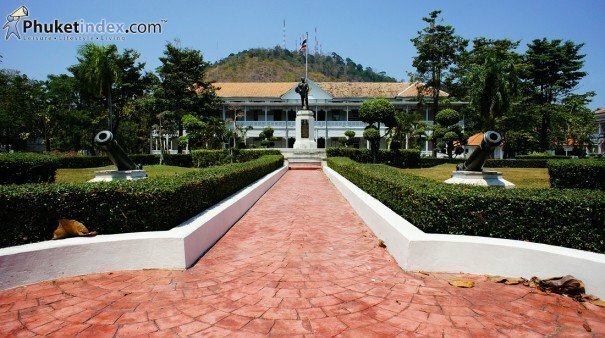 However, yesterday (8th April 2014) Phuket Provincial Hall opened its doors for the first day since, and the head of Phuket Provincial Hall. Civil Servants, along with other employees and officers returning back to work. Both the front and back doors have been opened to the public, who can now enter the building as normal. Since re-opening yesterday, most agencies are able to work as usual; however, the Passport Office is seeing a higher number of visitors than usual. 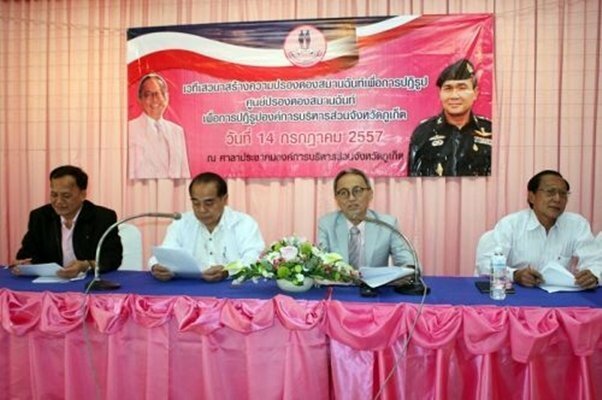 On 31st March 2014 at the office of the Phuket Lawyer’s Club, Acting Phuket Senator – Khun Chaiyos Panyawai held a press briefing having won the Phuket senator election on 30th March. Khun Chaiyos said “I would like to thank all those Phuket people who voted for me, and I am happy that I been selected to act as the Senator, however, I will have to wait for about 1 month for the election commission to approve the result. ‘I vow that after the Election Commission has verified the result certification I will serve to the best f my ability and in accordance with the law. I will act for the people of Phuket and will make the Phuket people proud. Before the election I had a chance to go around and meet some of the people who voted for me during my campaign, but unfortunately not in all areas. However, once the verification has taken place I will continue to go around meeting more people. Thank you all once again. 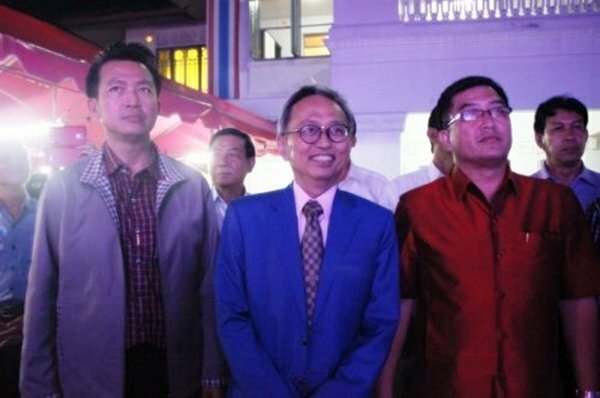 When asked what the first thing he will do as senator Khun Chaiyos said “I will find out more about what I am authorized to do under my role as senator, in addition to scrutinizing the law, checking the appointment and dismissal of politicians, also the work of the government. However, I would like to point out that I will not being doing this for one particular group; I will do it for the best of the country.